BeckerTime offers a selection of pre-loved Rolex GMT-Master mens stainless steel timepieces in size 40mm. The bezel options include the popular blue and red “Pepsi.” In addition, these handsome “Quickset” models come with Oyster bracelets. By browsing our selection, we’re confident that you will find a pre-loved Rolex timepiece for your distinct style. In addition, each purchase receives a 30-day money-back guarantee, as well as a Lifetime TradeUp Guarantee for qualified items. Also, we provide personalized customer service. So, please don’t hesitate to contact us if we can help you find that perfect fit or special gift. 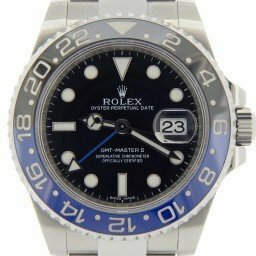 A common question for a first time Rolex sports watch buyer revolves around the differences between the Rolex GMT-Master II (16710) and the Rolex Submariner (16610). Both of these particular models are out of production. Fortunately, Rolex replaced them with their ceramic bezeled younger siblings, the GMT-Master II 16710 and the Submariner 11610. They are two of Rolex’s most popular models. In addition, these timepieces are readily available on the pre-owned market and places such as Beckertime. Here are the Rolex GMT-Master II vs Rolex Submariner comparisons. The company introduced both of these models in the mid-1950 as true tool watches. Rolex designed each with a specific purpose in mind. They designed the Submariner for underwater diving that became more prevalent as SCUBA diving hit the mainstream. Conversely, they designed the GMT for intercontinental flight and use by pilots to manage UTC time. Dial: Both watches share a similar dial and hand size. Also, they possess a slightly gloss black dial, SuperLuminova on the dial dots and hands, Gold hands and dial dots, and a white gold second hand. Case: Although a different model number is stamped on the case between the lugs, the case dimensions on both watches are the same. Bracelet: Both watches have a solid end-link bracelet, with hollow links made of 316L stainless steel. Crystal: Even though the Submariner has a higher depth rating than the GMT, both watches share the same crystal and crystal gasket. The difference in depth rating is because of the crown and caseback the Submariner uses. 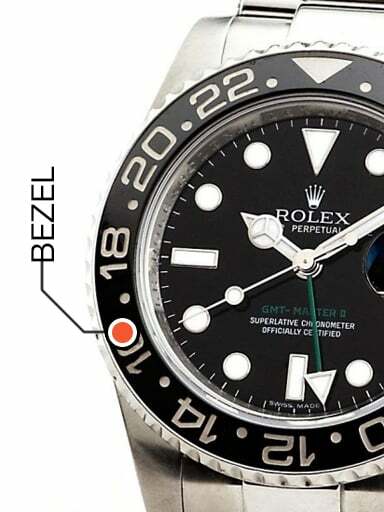 Bezel: One of the more visible differences is the bezel. Rolex designed the Submariner bezel for timing decompression stops underwater. It only rotates counter-clockwise, and has a luminescent pearl at 12:00 o’clock and is slightly thicker. The GMT bezel rotates both directions and marked in 24 hour increments. Each hour is used in conjunction with the 24 hand to track one or two timezones. 24 Hour Hand: The GMT utilizes a fourth hand that only makes one complete rotation in a 24 hour period. The 24 hour hand enables pilots and travelers track up to three different timezones when used with the 24 hour bezel. Caseback and Crown: Despite the similar case, the Submariner uses a thicker caseback and one that rises more than the GMT making the Submariner 13mm thick vs 12.45mm on the Submariner. Also distinguishing the Submariner is the Triplock crown that is water resistant to 300 meters versus the GMT Twinlock crown that possesses two fewer rubber o-rings making it water resistant to 100 meters. The Submariner’s thicker caseback and crown make the watch 135 grams versus the GMT slightly lighter 127 grams. Clasp: Both the Submariner and the GMT utilize the same Oyster hollow bracelet links, the Submariner’s clasp cover is slightly longer containing a wetsuit dive extension allowing the Submariner to be worn outside of a wetsuit. The GMT clasp has a smaller DateJust size clasp. Both the GMT and the Submariner have OysterLocks on the clasp preventing the clasp from accidental opening. This comparison between the Rolex GMT-Master II vs Rolex Submariner shows us differences in the caseback, the Submariner rides a little higher than the GMT. There is really no wrong choice between these two watches. But, the only way to tell which one “feels” better is to try on each of them. For many Rolex fans, there really is only one pilot’s watch — the GMT-Master. Designed specifically for pilots, the GMT-Master permitted aviation professionals to keep track of various time zones as they flew around the world. In fact, Rolex originally produced the GMT-Master for Pan Am. Soon after, it was adopted by other pilots, and finally by the general population. But, there’s no denying the practicality of the Rolex GMT-Master, regardless if you know how to fly a plane or not. Ultimately, this is a storied and popular Rolex watch. However, it is the GMT-Master bezel that is the one component that really characterizes this handsome timepiece. So let’s dig into some of the finer details. 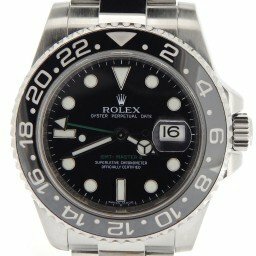 What’s the GMT-Master bezel for? First and foremost, let’s get back to basics; what is the bezel on the GMT-Master watch for? The first thing you’ll note about the bezel is the 24-hour markings. Therefore, along with the extra 24-hour hand on the dial, the bezel’s primary function was to allow wearers to see the time in another time zone. Many pilots set that second time zone to Greenwich Meridian Time (GMT) standard, hence the name of the watch. Also, you’ll notice the red and blue colors on the bezel of the original GMT-Master. Aside from looking great, the reason for two colors was to quickly differentiate between daytime and nighttime on the 24-hour bezel. On the GMT-Master models, the 24-hour hand and the center hour hand are not independent of each other. Therefore, the second time zone is determined by turning the bezel to have the 24-hour hand point to the appropriate hour. On GMT-Master II references, however, the pair of hour hands are autonomous, thus allowing the indication of a third time zone. Which Bezel Colors are Available with the Stainless Steel GMT-Master Watches? There are in fact five different bezel color options on stainless steel GMT-Master watches. 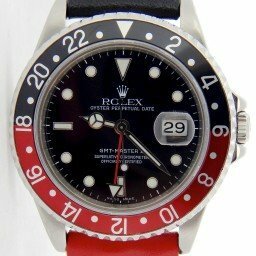 As previously mentioned, the original and subsequently most iconic bezel on a Rolex GMT-Master mens stainless steel watch is the red and blue bi-color bezel. In Rolex circles, this particular bezel is nicknamed the “Pepsi” for its similarity to the beverage logo. There are many stainless steel GMT-Master “Pepsi” models including ref. 6254, ref. 1675, ref. 16750, ref. 16700, and ref. 16710. Staying on the soda theme, there’s also the red and black “Coke” bezel, which made its debut on the inaugural stainless steel GMT-Master II model, the ref. 16760. Or, if you prefer a slimmer and newer edition, there’s also the GMT-Master II ref. 16710 with a “Coke” bezel. The all blue bezel, nicknamed the “Blueberry,” is actually very rare. It was only available on some custom-ordered stainless steel GMT-Master ref. 1675 watches in the 1970s. These were never available to the public in Rolex boutiques. The black and blue ceramic bezel is the newest type of bezel available on the stainless steel GMT-Master. Nicknamed the “Batman,” Rolex unveiled the black and blue Cerachrom ceramic bezel in 2013 on the ref. 116710. Finally, there’s the ubiquitous black bezel. Introduced on a stainless steel GMT-Master ref. 1675 in the 1970s, most steel GMT-Master models (except for the ref. 6524 and the ref. 16760) offer the black bezel option. 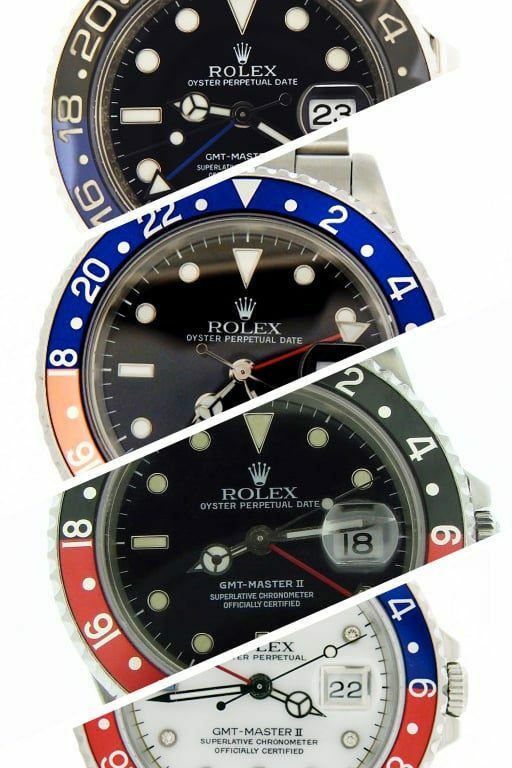 With color options that range from all black to both blue and red and some more shades in between, settling on just one stainless steel GMT-Master Rolex watch may be a little challenging!